Die Heldengalerie des Qianlong-Kaisers stellt die erste umfassende Dokumentation und Analyse eines in der chinesischen Kunstgeschichte zahlenmäßig absolut einmaligen, nicht mehr übertroffenen Bildprogramms dar. Hiermit wird erstmals eine systematisch vergleichende Arbeit über das Genre des Porträts verdienter Untertanen (gongchenxiang bzw. gongchentu), womit in diesem Falle spezifisch Offiziersporträts gemeint sind, im 18. Jahrhundert vorgelegt. Bilder dieses Typs des verewigten Helden wurden – zumindest bis in die jüngste Vergangenheit – nicht ernsthaft als Kunstwerke betrachtet. Die Untersuchung behandelt in vier Themenkomplexen Tradition, Kontext der Werkgenese, Bildaufbau einschließlich Format- und Serienversionen sowie Funktion dieser außergewöhnlichen Bildgattung. Ein ausführlicher Werkkatalog und Tabellen im Anhang sowie ein separater Abbildungsteil auf der beiliegenden CD ergänzen die Studie. Kraak porcelain is a Chinese export characterized mainly by blue and white painting and paneled decoration with popular motifs from the late Ming Dynasty. This study sets focus on the origins of Kraak porcelain based on its concept, type, and decoration, supported by the use of philological and archeological methods. The analysis leads to the conclusion that the origins of Kraak porcelain are not an accidental result of Chinese porcelain development but the achievement of various influences, both from East and West. The origins of decoration and iconography were derived from Chinese ink painting and woodblock prints of the Ming Dynasty. The art of Southeast Asia, The Middle East, and Europe influenced the prototype of the creation of Kraak ware in type and ornament, which was designed specifically for these markets. The pluralistic impact also considers European ornaments, Islamic pottery paintings, and contemporary popular religious elements. This is the first volume of an extensive series dedicated to the Buddhist stone sutras carved into stone in several Chinese provinces. The sutra texts in Shandong, dating from about 560 to 580, were cut into bare rock under the open sky. These little-known monuments are a major chapter in the history of art, in the Buddhist textual tradition, and in landscape design. The volume presents startling scripts on precipitous cliffs and massive boulders both in photographs taken at the sites and in rubbings made in ink. Not only does this corpus offer major religious texts, but it also makes available almost unknown calligraphic achievements. Among them are names of Buddhas, up to nine meters high, that were only discovered in the 1990s. All texts at a particular site, including the passages from the Buddhist sutras and the later colophons, have been completely documented, translated and analyzed. They shed new light on an exciting period in Chinese history, when the Middle Kingdom was intimately engaged with Inner Asia and even India. The foreign religion, which brought the anthropomorphic pantheon to China, manifests itself here in the quintessential Chinese medium of calligraphy. The research has been conducted by an international team led by the renowned scholar Professor Lothar Ledderose and supported by the Cultural Authorities in China. The volumes, bilingual in Chinese and English, are directed at a wide audience. They are jointly published by Harrassowitz and the China Art Academy in Hangzhou. Souvenirfotografien in der Meiji-Zeit zeigten inszenierte Darstellungen. Der Fotograf Kusakabe Kimbei (1841–1934) gilt als einer der bedeutendsten Produzenten von Souvenirfotografien im Japan des ausgehenden 19. Jahrhunderts. Seine Bilder zeigen japanische Schönheiten bei unterschiedlichen Handlungen. Diese fotografischen Inszenierungen entstanden in Anlehnung an japanische Bildtraditionen. Ausgangspunkte der Untersuchung von Mio Wakita sind: die soziokulturelle Identität der Modelle, die Darstellungskonventionen japanischer Frauen der Meji-Ära sowie Kimbeis visuelle Kodierungen japanischer Weiblichkeit. Das Buch beleuchtet die komplexen visuellen Bedeutungsstrukturen und zeigt, welche vielschichtigen Bedeutungen Kimbeis Frauenbilder haben. 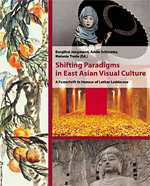 Shifting Paradigms in East Asian Visual Culture. Kaum ein anderer hat die Kunstgeschichte Ostasiens mit seinen vielfältigen, umfassenden und innovativen Forschungen so maßgeblich beeinflusst wie Lothar Ledderose. Das geographische, zeitliche und thematische Spektrum, das im Band repräsentiert wird, reflektiert die Entwicklungen, Methoden und Erkenntnisse, die diese Disziplin in den letzten Jahren erfahren hat. Ehemalige Schüler Lothar Ledderoses erörtern in 18 Aufsätzen Themen wie Grabarchitektur, Buddhistische Höhlentempel und Steinschriften, Vormoderne und Moderne Malerei sowie Ausstellungs- und Kunstpolitik. Aber auch Kalligraphie, Fotografie, Textilien, Grafik und Keramik aus China, Japan und Korea sind Gegenstand der Untersuchungen. Des Weiteren wirft der Band einen Blick auf transkulturelle Tendenzen zwischen Ostasien und Europa wie auch innerhalb Ostasiens.